KUCHING May 22nd: At 11am today, SAVE Rivers and 300 indigenous people from all around Sarawak protested outside the Borneo Convention Center Kuching where the International Hydropower Association’s biennial congress is being held. They arrived at around 10.30am carrying banners saying ‘Respect Native Rights’, ‘Stop Baram Dam’, and ‘IHA Stop Collaborating With Corrupt Regime’. Dressed in blue shirts saying ‘No More Dams’, the 300 protestors raised their voices peacefully against the proposed dam projects for more than an hour at the entrance of the BCCK. Richard Taylor, Executive Director of the IHA, came out to hear Mark Bujang, SAVE Rivers’ Secretary give his statement to the press and had a brief conversation. Protesters managed to get to the main entrance of the BCCK where delegates of the IHA Congress came out to watch were handed informational leaflets by SAVE Rivers volunteers. ‘Indigenous communities are voicing their opposition to the dams being built on our land. We were not given a voice inside the congress so we are using our voices here in the form of a protest’ said Mr Bujang. 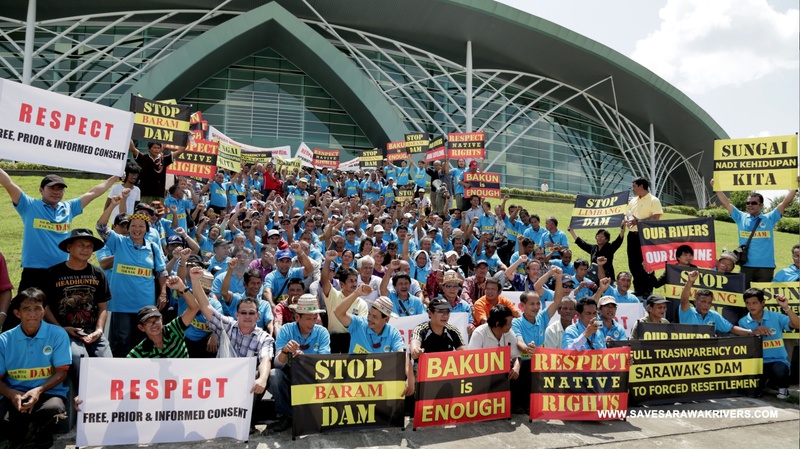 The 300 protesters included members of dam affected community members from Bengoh, Murum and Bakun and also community members from the proposed dam sites at Baram and Limbang. ‘We all came to Kuching today to show IHA, Sarawak Energy and the Sarawak Government that despite what they say, we disagree with the dams. I live in a dam affected area so it is too late for us but I do not want see others suffer as we have.’ said Ngajang Midin from Long Ayah, a community affected by the Bakun Dam. Johannes from Long San, Baram, said that people in Baram oppose the proposed Baram dam. The protesters dispersed peacefully at 11.40. SAVE Rivers also announced their Alternative Conference taking place tomorrow, 23rd of May. The all-day event will take place at the Riverside Majestic Hotel and will include speakers from affected communities with special guest, Bob Brown, ex-Australian senator and renowned dams activist.